PhoneLog is a simple, low resource background service that logs phone activity to your device's calendar. This can be helpful if you're required to log phone calls for legal & billing purposes or if you just want to keep better track of your minutes and who you talk to. Once a your calendar has been populated with your phone activity you can easily sync your device to copy the information to MS Outlook, Google Calendar, etc. using any preferred syncing software. v1.3 - Added feature to disable logging on specified days of the week, prompt before logging and an advanced option on whether or not to strip the formatting from the logged phone number. v1.2 - Fixed call duration problem. Calendar entries now show caller id information instead of the phone number. v1.1 - Adds the ability to log SMS messages. 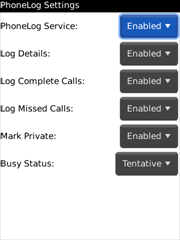 v1.0 - Initial relase with functionality to log phone calls, enable privacy options and set busy status. The latest release is v1.3 and can be downloaded the latest version from PhoneLog Download. Requires a Blackberry device with OS 4.3+ and a valid Blackberry data plan (email me for a work around if you don't have a data plan). The trial version of phone log only allows you to enable/disable the service and will only log incoming, outgoing and missed phone calls (sufficient for most users). Notice: If you use a BES or an Exchange server and do not want your logged calendar entries to be public to your corporate calendar I'd suggest buying the full version and enabling the "Mark Private" option. Notice: If you are using a Blackberry Storm, you will need to "Disable Compatibility" on PhoneLog in order to use the application in full screen mode. Consult the phone's documentation on how to do this. After installing PhoneLog you can access the settings by viewing the PhoneLog Settings in the main Options application. If PhoneLog does not appear in the Options panel, you can initialize it by click on the PhoneLog application link, then visit the Options panel. PhoneLog settings on Blackberry Storm. Logged phone calls in calendar on Blackberry Pearl. Google Calendar that has been sync'd with a device running Phone Log, if anything it looks impressive. PhoneLog is designed to launch whenever the phone is rebooted. To access the PhoneLog options, launch the PhoneLog Settings from the Blackberry's Options menu, or launch PhoneLog from the application icon. This option will enable or disable the entire PhoneLog service. If you wish not to have the service logging any information, change the setting to disable. Disable this service to stop all phone call logging. If selected, this will enable PhoneLog to log all incoming, completed (answered) phone calls. If selected, this will enable PhoneLog to log all outgoing, dialed phone calls. If selected, this will enable PhoneLog to log all incoming, unanswered phone calls. This option will indicated whether or not to prompt the user whether or not log the completed phone call. Missed calls will still be logged as normal. If the Prompt Beofre Logging is enabled, this option will allow the user to input additional call notes on completed calls that will show up in the Notes section of the calendar entry. 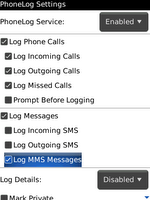 If this option is disabled, all SMS message logging will be disabled. If enabled, PhoneLog will record all incoming SMS messages as a calendar entry. If enabled, PhoneLog will record all outgoing SMS messages as a calendar entry. The log details setting determines what information, if any, will show up in the Notes section of the calendar entry. Limited details will only show the phone number of other lined that was connected or that initiated the connection. Full details will show the phone number, call duration, message details and any additional information that may be added in the future. If set to Caller ID, PhoneLog will use the caller id information provided by the Blackberry device as part of the subject on the calendar entries. This will include the caller's name if the caller has been setup in the address book and may include the phone number type (ie work, home, etc.). If set to Phone #, then only the phone number of the caller/sender that is reported by the Blackberry will be displayed. If selected, PhoneLog will mark all logged calendar entries as "private". This option is useful if you sync your calendar with a corporate server and do not want to make your PhoneLog entries public. This indicates how PhoneLog should mark the calendar entries' busy status option. This indicates which days PhoneLog should enabled logging on. This indicates what time of the day PhoneLog should enabled logging on. If the times are set the same time, then PhoneLog will log for a full 24hrs.